Scythe almost flew under my radar. I’ve never read anything by Neal Shusterman before and hadn’t heard about this one until all of a sudden those closest to me kept talking about it. Then I went to the Simon & Schuster Canada preview and they built up even more hype for this title for me. I’m always scared going into titles with that much excitement but let me tell you…it blew my expectations OUT OF THE WATER! 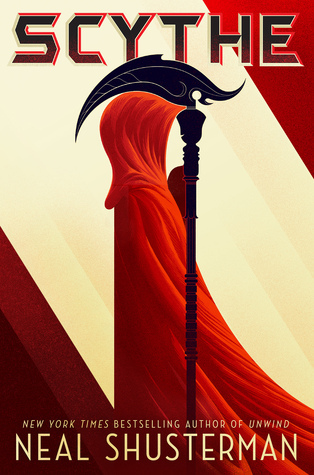 There are so many incredibly powerful questions raised through the plot of Scythe and what I love is that nothing is easily resolved or quick-fixed. It looks at morality, human nature, power, corruption, and the actual feasibility of a Utopian society. We are complex creatures and even when we think we have it all figured out, we probably (usually) haven’t figured out as much as we think. Scythe doesn’t give you any answers to the burning questions and conundrums of humanity but it definitely makes you think. I was also super invested in the plot and the well-being of all (okay almost all) the characters. For me, if I’m not sucked into the story within the first couple of chapters then you’ve lost me. I was in from the very start, there was no question. The premise is so interesting and the characters are very compelling. I adore Citra, Rowan, and Scythe Faraday and on the other end of the spectrum straight up despise Scythe Goddard and his flashy posse; I love when characters make me feel so intensely. I not only highly recommend this book but would likely do some questionable things to get my hands on book 2 right this second. It’s honestly so good and intense. Just read it, okay?